From the moment their elegant gift box is opened, all the way to the happy memories they inspire, these berries deliver a singularly sensational experience of extraordinary pleasure. Each plump, vine-ripened strawberry is specially selected for its size, sweetness and juiceness, & is topped with a healthy head of natural green strawberry leaves. It's then hand-dipped in velvety Real chocolate - dark, milk or white in this assortment - ridged with countless zig-zagging ribbons of romantic, blushing pink drizzle. 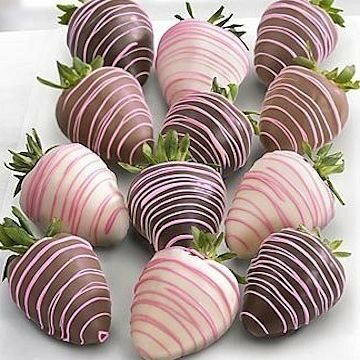 With every bite, the strawberry's bright, sweet juice erupts into the mouth & never ceases to dazzle as its luscious & perfectly gorgeous natural flavor contrasts & mingles with smooth, creamy chocolate. This gift includes the following: 12 piece selection, arrives in an elegant gift box.